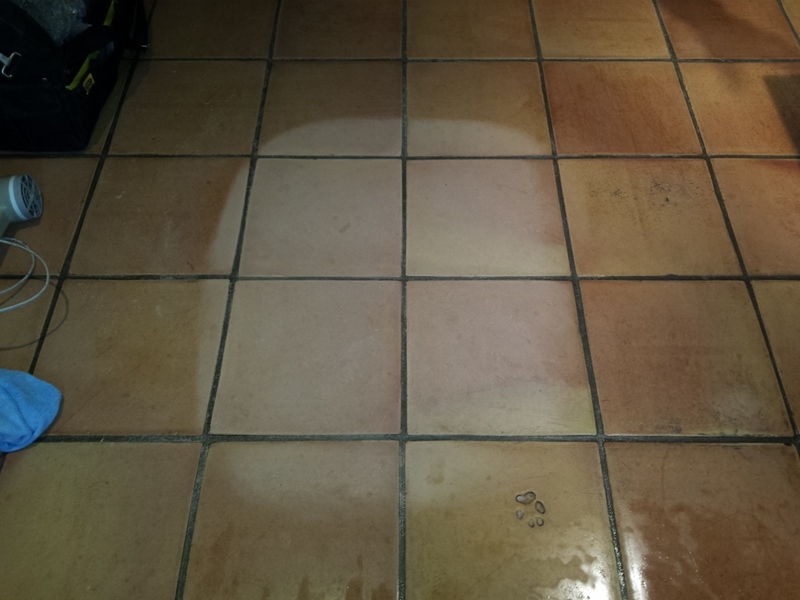 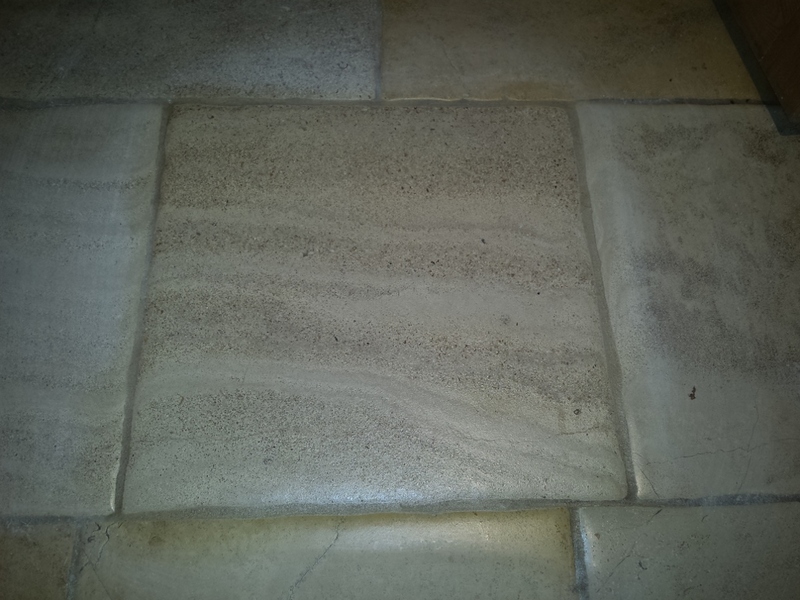 This natural stone floor cleaning in Oxford shows what an amazing difference we can make to your floors! 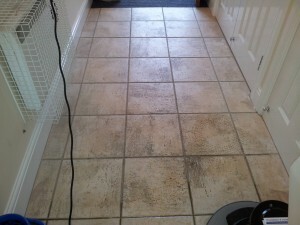 Before, you can see there were grubby, discoloured grout lines and the stone looked dull and lacked the wow factor. 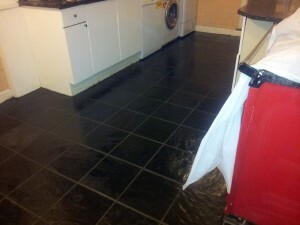 In the photos below, the second photo just shows the floor after cleaning and before sealing it. 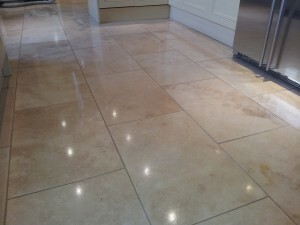 The natural stone floor already looks brighter and lifts the appearance of the whole kitchen. 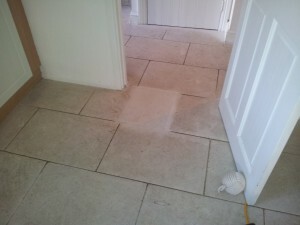 The photo below shows the far area having been cleaned and the nearest part hasn’t been done yet. 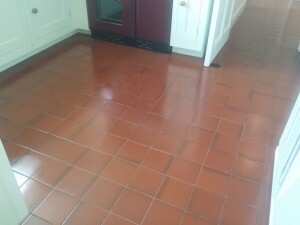 The difference is amazing and it looks like a different floor! 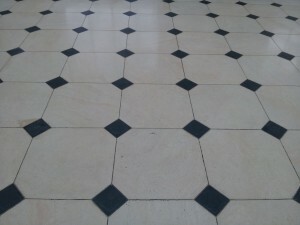 To achieve this, the floor is stripped back to the bare stone and deep cleaned using the appropriate machinery and products including scrubbing all the grout lines clean by hand. 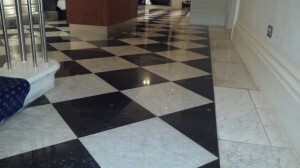 With our meticulous attention to detail, no part of the floor is left untouched and the results speak for themselves. We then went on to seal the floor with several coats of a water based natural stone sealer to give the floor a lovely sheen to the customers desired level of shine. 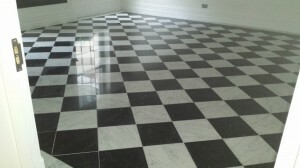 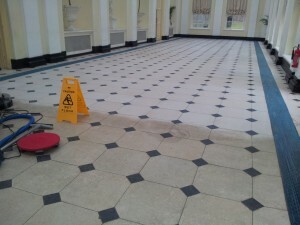 As well as looking stunning, this will facilitate with daily maintenance and keep the floor looking cleaner for longer. 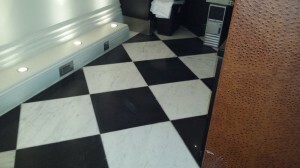 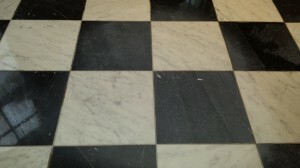 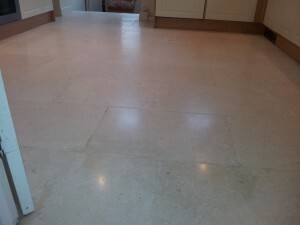 We can clean any type of stone floor, be it limestone, travertine, marble, sandstone, slate or any other. 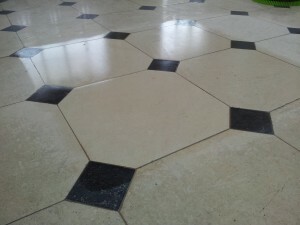 Contact us today for advice on your natural stone cleaning in Oxford and for a free no obligation quotation. 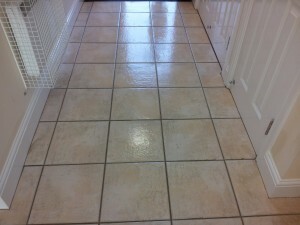 To show you how clean we can get your floor. 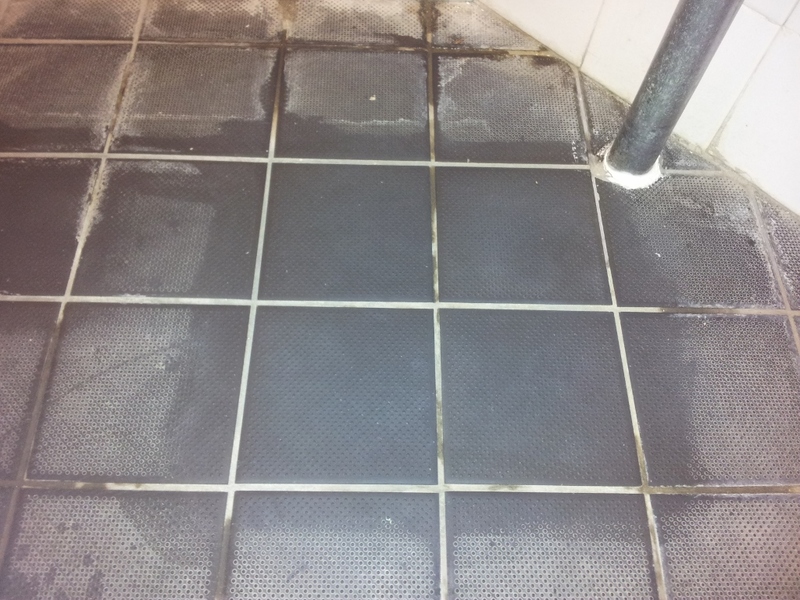 A lot of customers do not realise how dirty their floor actually is until we do them a sample for them which usually shows a massive difference! 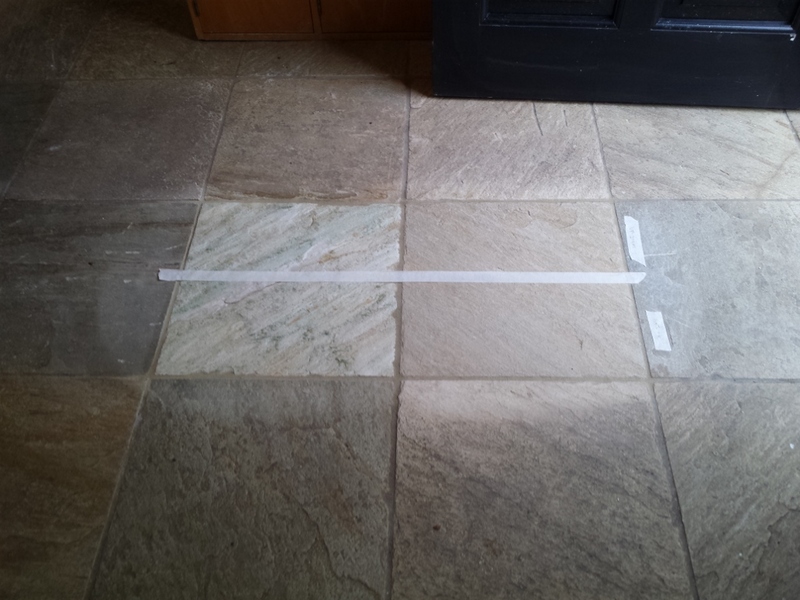 To help us determine what can and can’t be achieved and how long it will take. 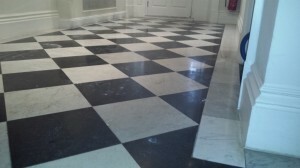 Every floor is different and what we use to strip and clean the floor depends on type of floor, what has been applied to the floor in the past, how dirty it is, if anything is on the surface i.e. 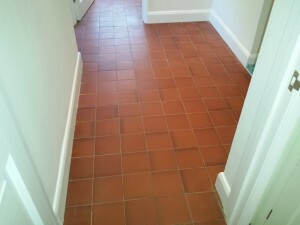 paint, plaster, glue, wax etc. 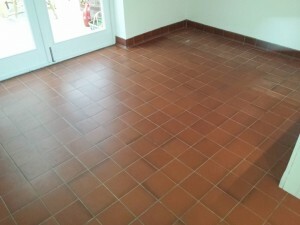 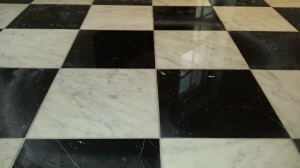 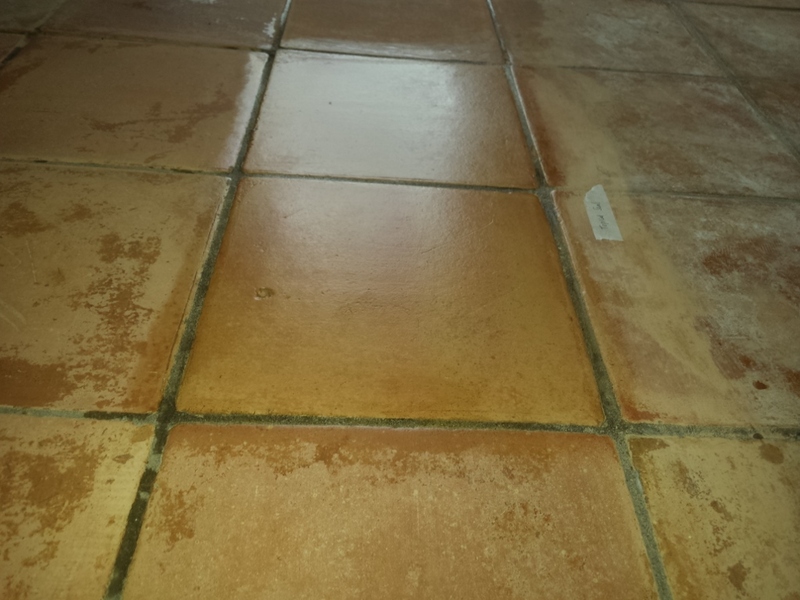 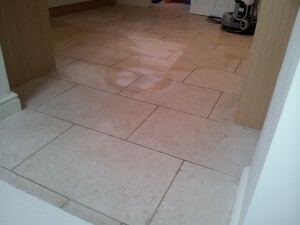 Sometimes it is not possible to remove all marks/stains from a floor particularly on the more porous stones and on very uneven surfaces such as some slates, or stone that is very pitted such as some travertine, we cannot always remove dirt from into all the undulations and pits so this can be demonstrated to the customer also. 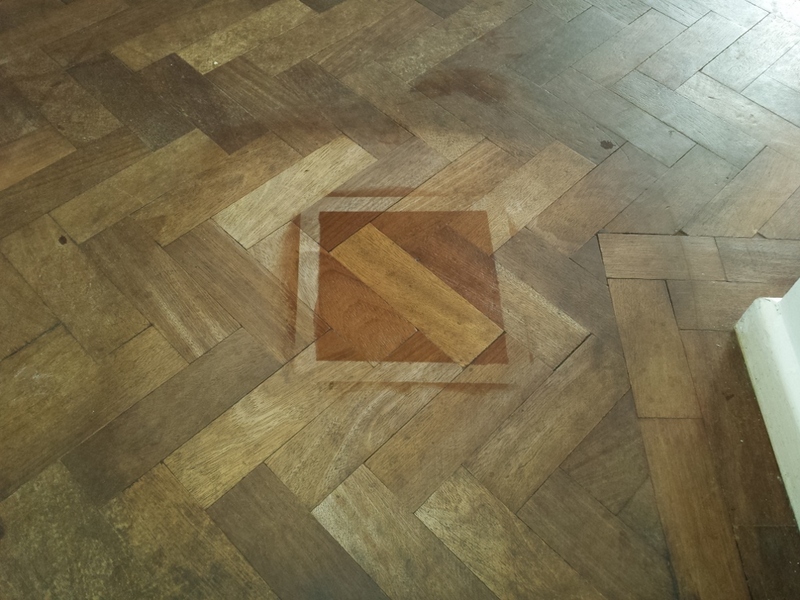 To demonstrate different finishes i.e. 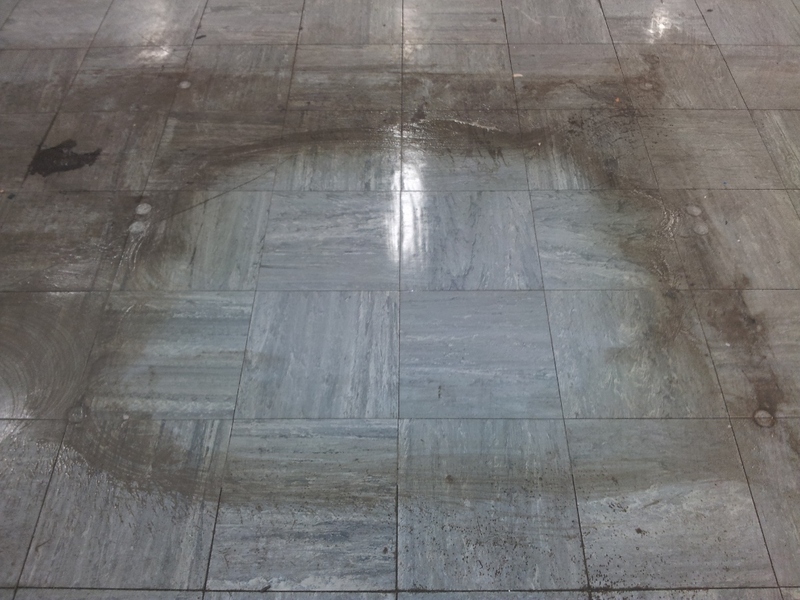 different topical seals for a matt, light sheen or high gloss finish, polishing and impregnating vs topical seal, grinding vs polishing or sealing, honing etc. 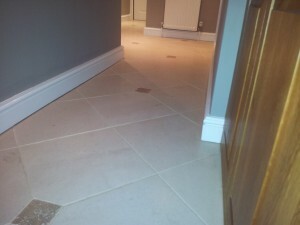 There are so many different options and not all finishes always suit your floor i.e. 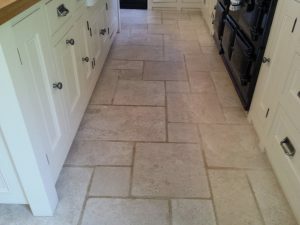 natural stone can vary in porosity across a floor and be more open in places than others and so therefore a topical seal can sometimes look patchy as it gets absorbed differently. 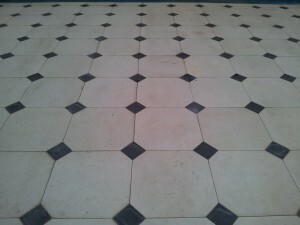 These quarry tiles look stunning after having been deep cleaned and sealed using our specialist processes and products. 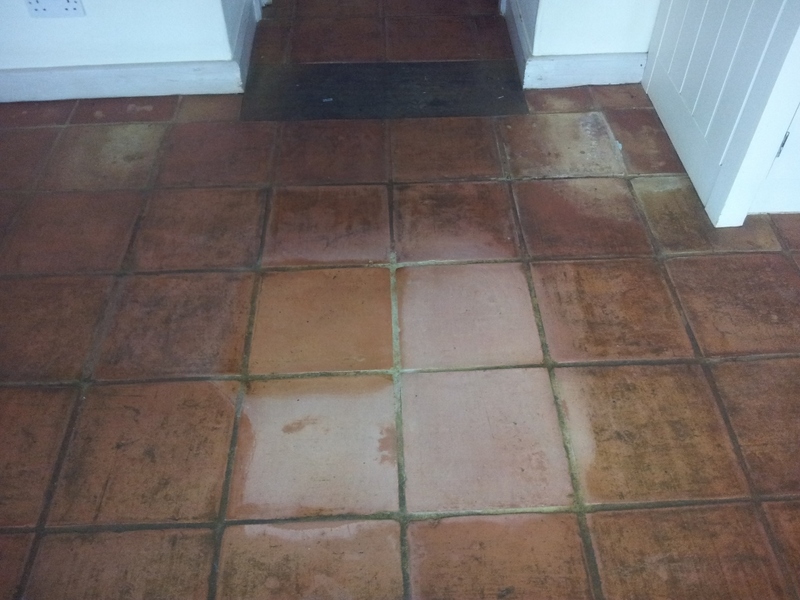 They were previously a little grubby, and were dull and patchy and in need of some TLC. This quarry tile floor cleaning and sealing in Oxford was finished to a glossy finish and the colour was also greatly enhanced. 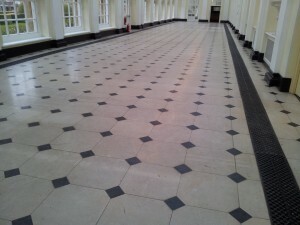 We have breathed new life into these floors, adding the wow factor and making them easier to maintain. The customer is extremely pleased. 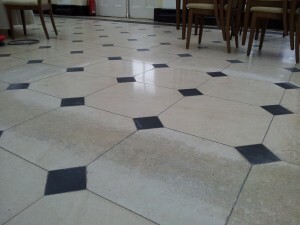 If you are looking for hard floor cleaning companies in Oxford or quarry tile cleaning in Oxford then Contact us for a free quote today. 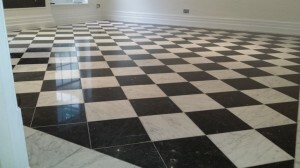 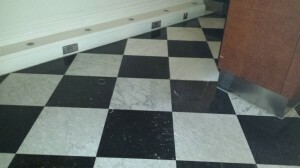 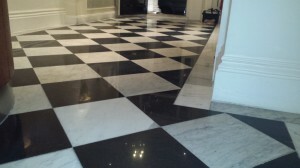 Floor Restore Oxford Ltd completed this marble grinding in London to a commercial premises with reception area and meeting room. 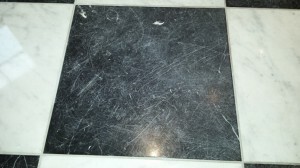 It is hard to tell from all of the other photos below, but this close-up shows just how scratched this marble floor restoration job actually was. 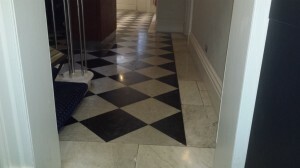 These marble floors required a full diamond grind to get them looking as they should, and we started by carrying out a sample area to show the results we could achieve. 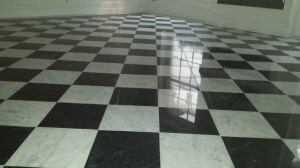 If you are looking for marble grinding companies in Oxford or London, then give us a call on 07876255526 and we can arrange a free quotation. 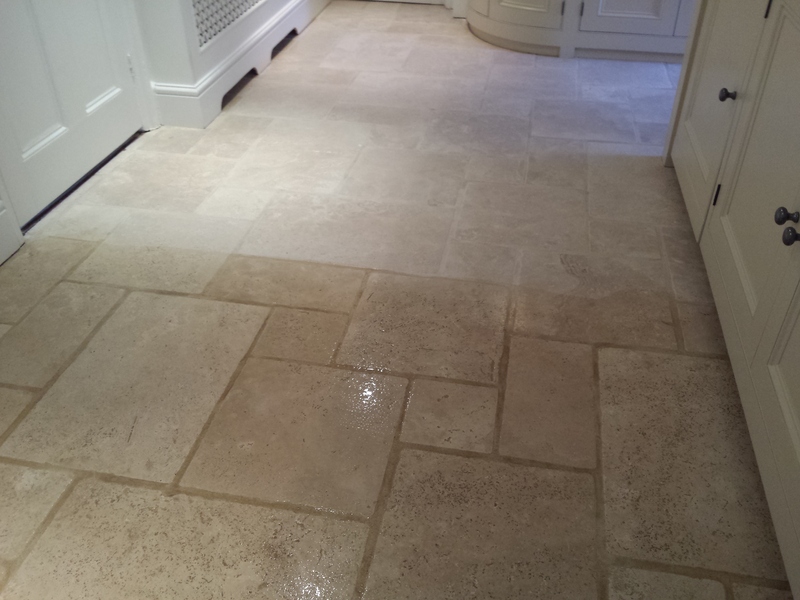 We knew after doing a sample patch on quoting for this limestone restoration in Oxford, that these floors were going to clean up extremely well – see picture below! 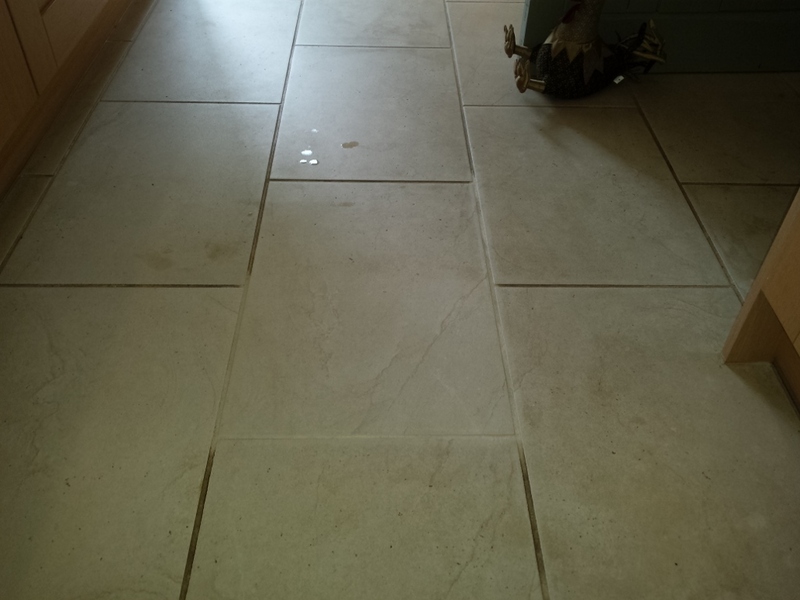 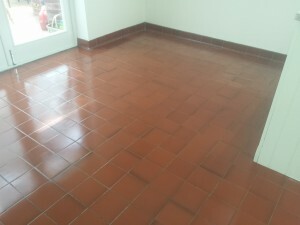 Both the tiles and grout lines were very grubby, and the customer wanted her limestone floor cleaning carried out by a professional stone cleaning company in Oxford, to bring her floors back to a like new condition. We were able to do this by first of all stripping back the floor and deep cleaning the stone and grout lines with our specialist machinery in conjunction with the best products on the market. 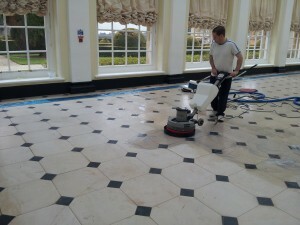 We then polished the floors to give them a light sheen as requested and impregnated to protect against spillages etc. 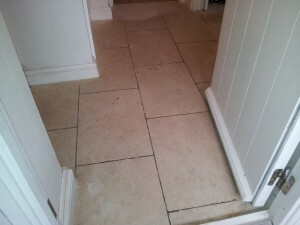 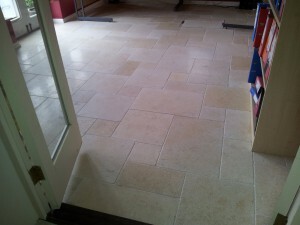 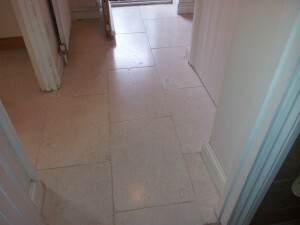 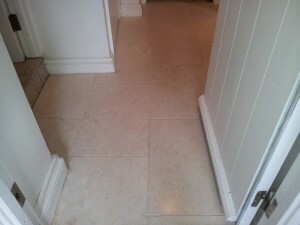 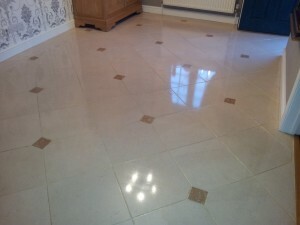 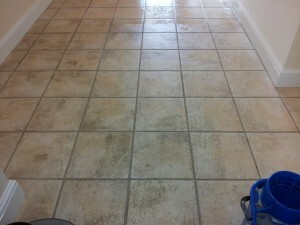 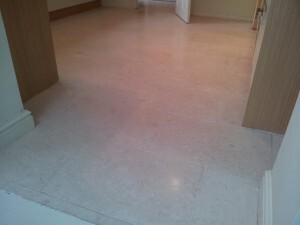 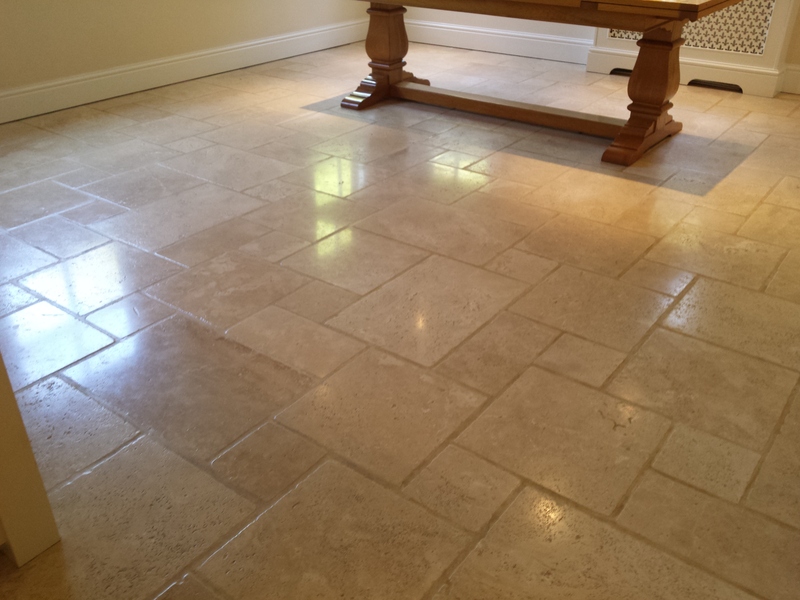 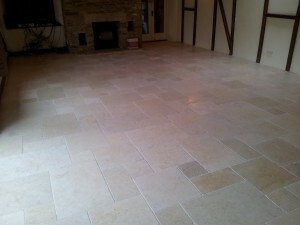 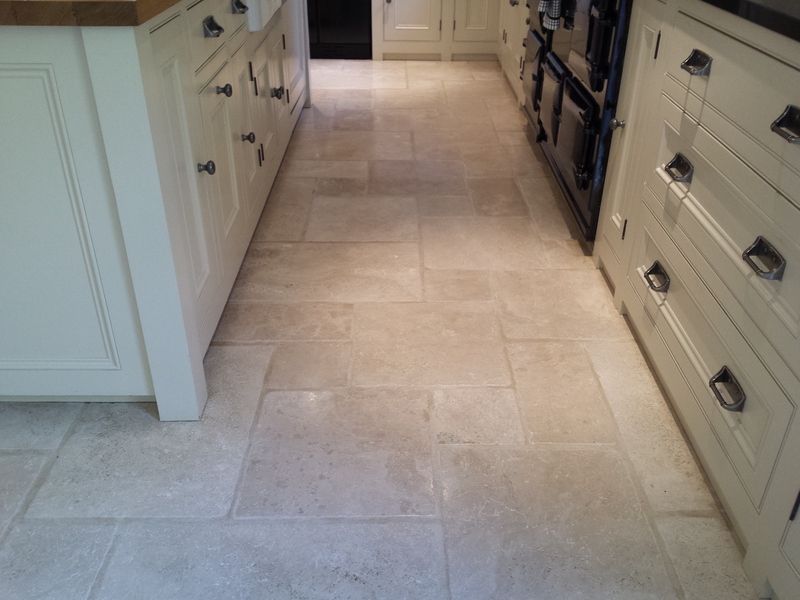 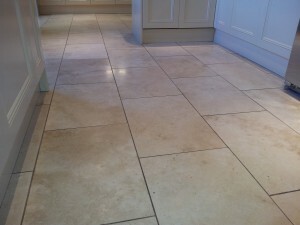 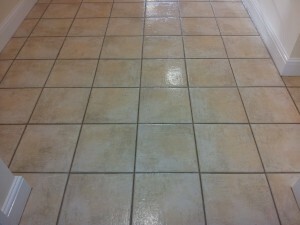 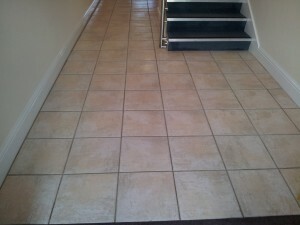 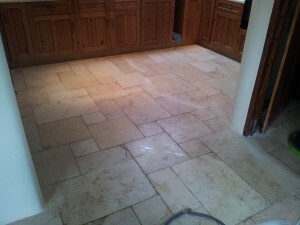 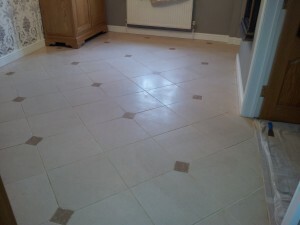 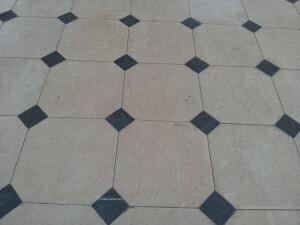 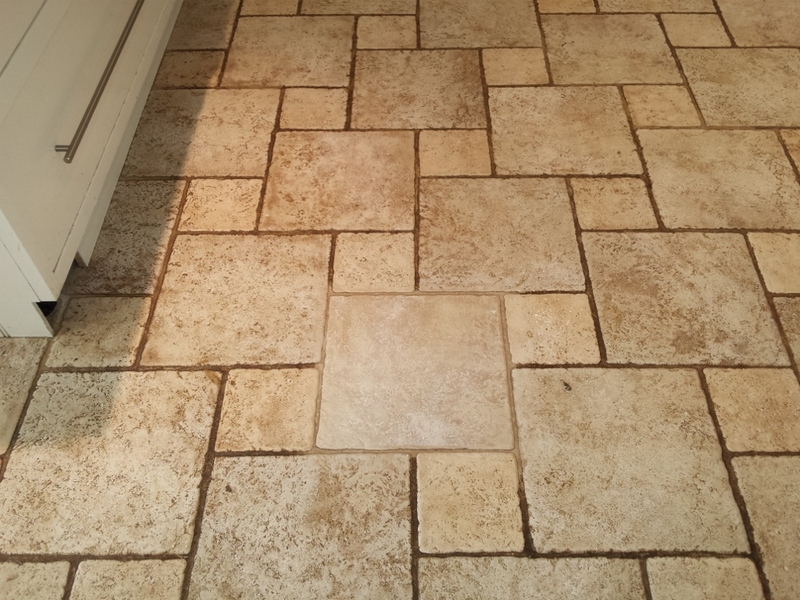 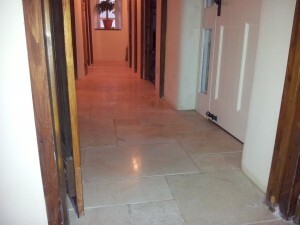 For a FREE quotation on your limestone floors, please contact us here: Limestone Cleaning Oxford or call 07876255526. 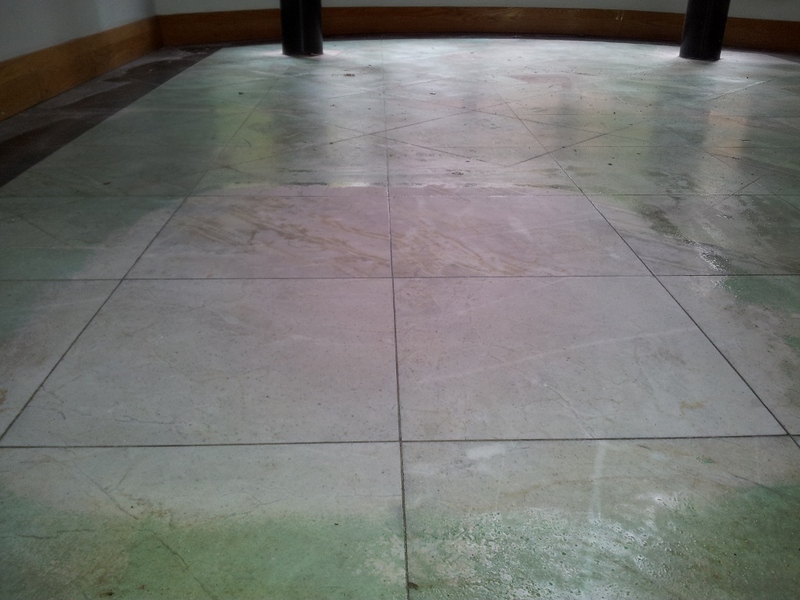 Stone floor stripping, cleaning, grinding, polishing, impregnating. 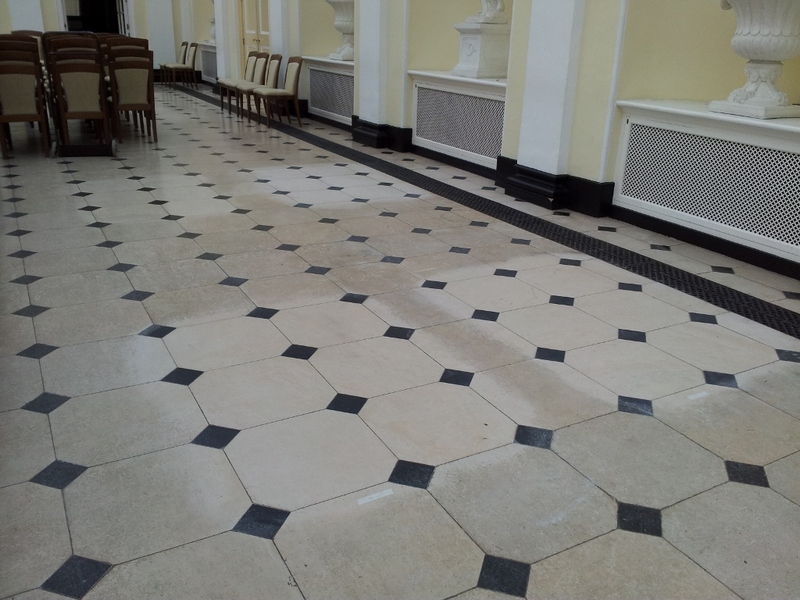 We were very privileged to be given the honour of restoring and now maintaining this beautiful stone floor in the Orangery at Blenheim Palace. 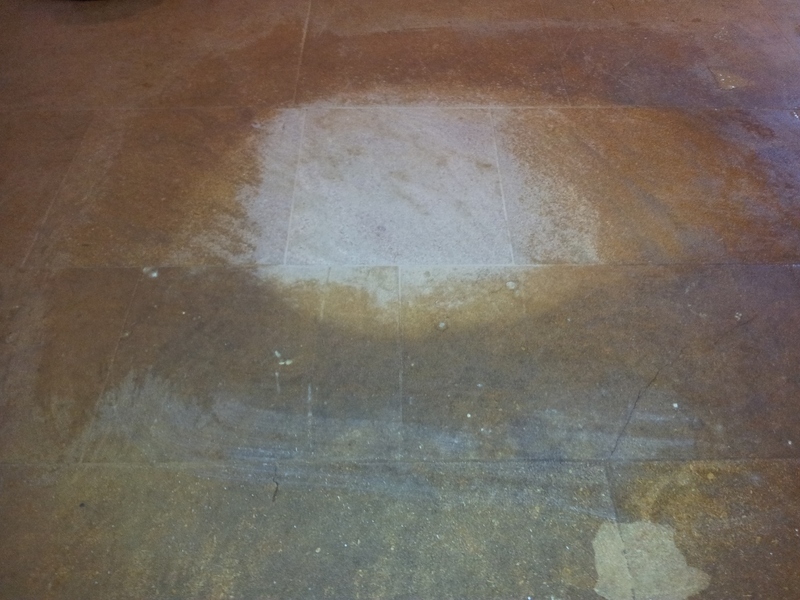 It had years and layers of sealed in dirt which was peeling and looking terrible. 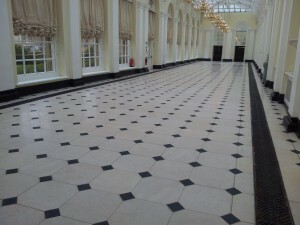 The Orangery is used for functions such as luxurious weddings and dinners, and so the floor needed restoring back to its former glory in order to look stunning for these grand functions. Firstly, on being asked to quote, we carried out several different test patches using different products, equipment and finishes to help us to decide what would be best to use on this particular floor and to judge how long the work would take. 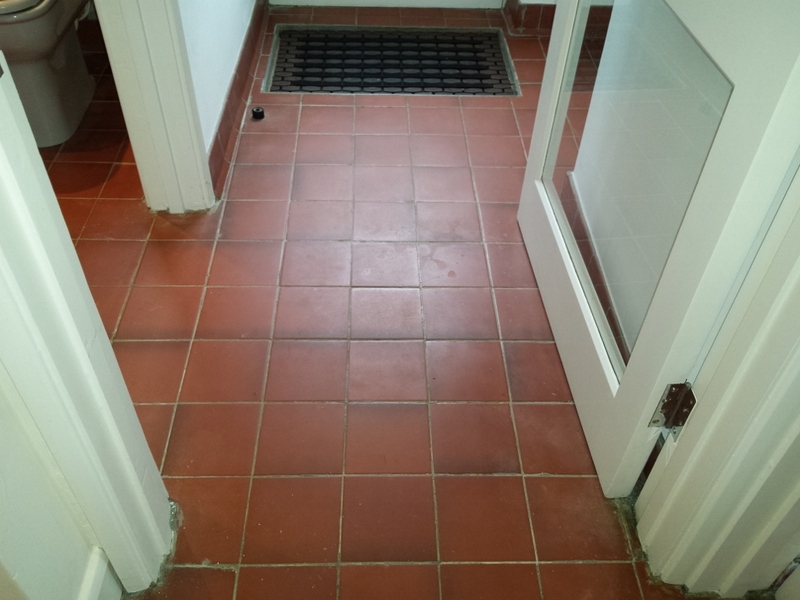 On starting the work, we began by preparing the room including masking up the heating vents around the edges to prevent water from getting into them. 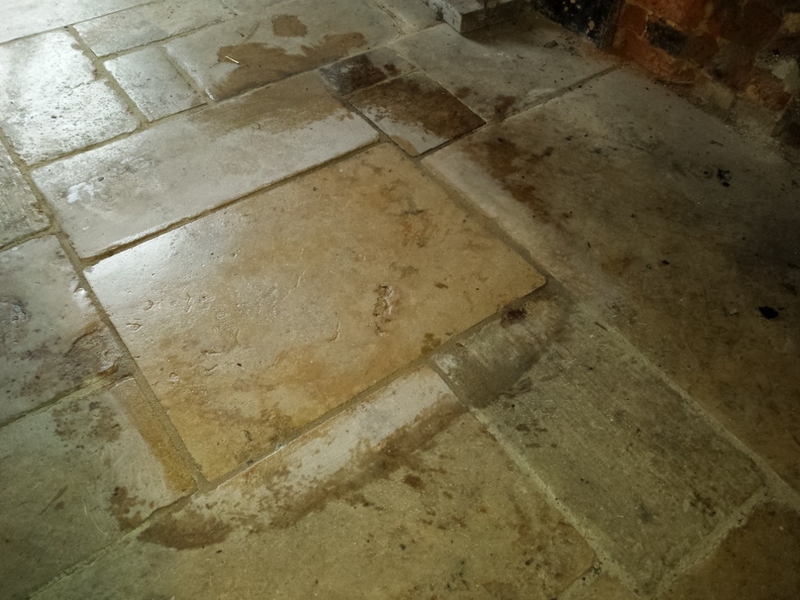 We then set to work stripping the floor right back to the bare stone and deep cleaning with our carefully selected products suited to this specific floor and seal to strip. 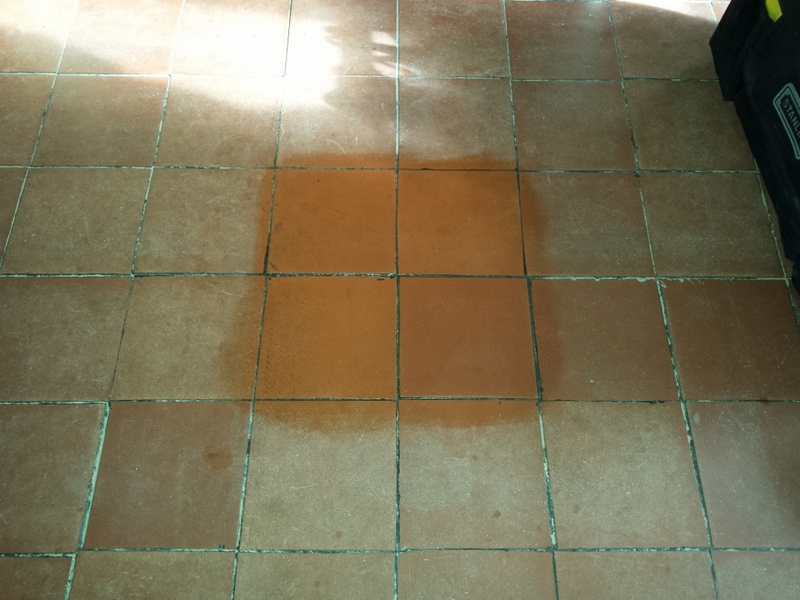 We used this in conjunction with our superior machinery and equipment including our unique stripping system, rinsing as we went. 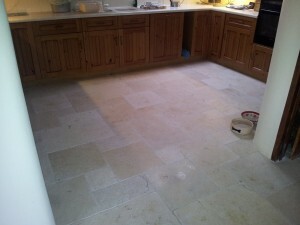 This was a mammoth task in itself! 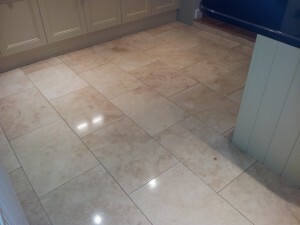 Next we polished the stone through a range of grits along with a product to further clean the stone. 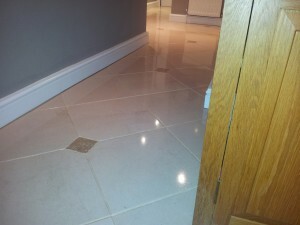 The floor was polished to a light sheen finish as requested by the client and impregnated. 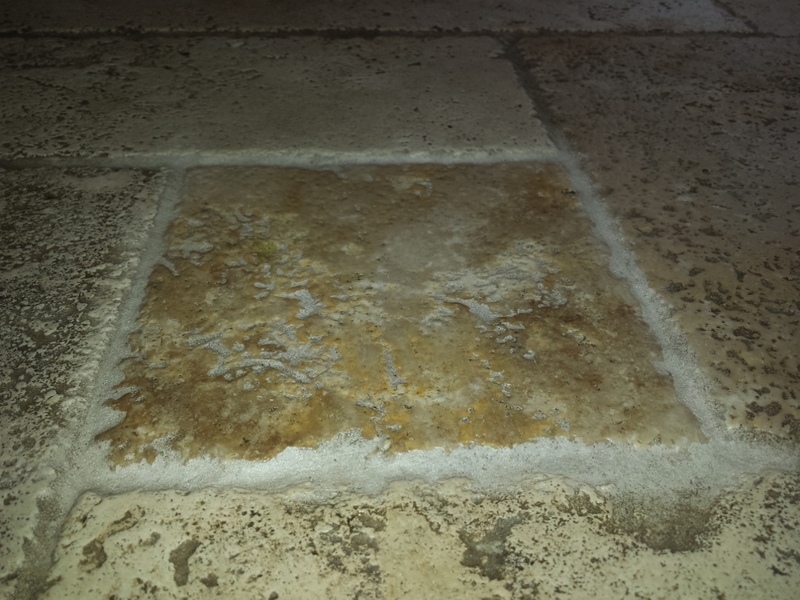 The light sheen finish is perfect for this space and having impregnated the stone rather than sealing it has brought out the natural colours and beauty of the stone, and is far better suited to the Palace in which it is situated. 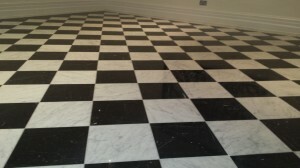 The floor as a whole is also much cleaner and brighter which enhances the room greatly.A high gloss finish would have been very hard to maintain in a busy commercial environment such as this one, where chairs and tables are constantly rolled in and out of the room and there is lots of foot traffic including high heeled shoes. The manager who we liaised with on this project was delighted with the overall results! 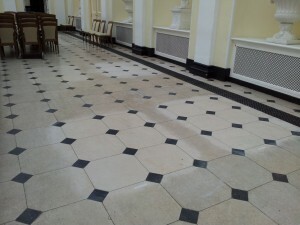 We will now continue to maintain this floor on a regular basis, cleaning, re-polishing and topping up the impregnator each time to keep their floor looking beautiful all year around. 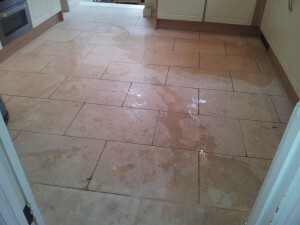 This beautiful Travertine floor was particularly grubby in the kitchen and hallway and required professionally cleaning by Floor Restore Oxford Ltd. We are Travertine floor cleaning specialists in Oxford and as you can see from the pictures, we made the floors look like new again! 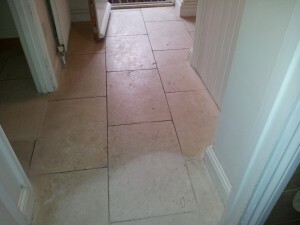 First of all we had to fill in a few large cracks before doing anything else – these are much improved and not as visible now. 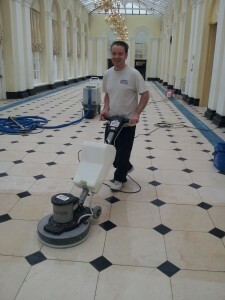 We then set to work deep cleaning the stone and grout lines, and finishing with a matt finish. 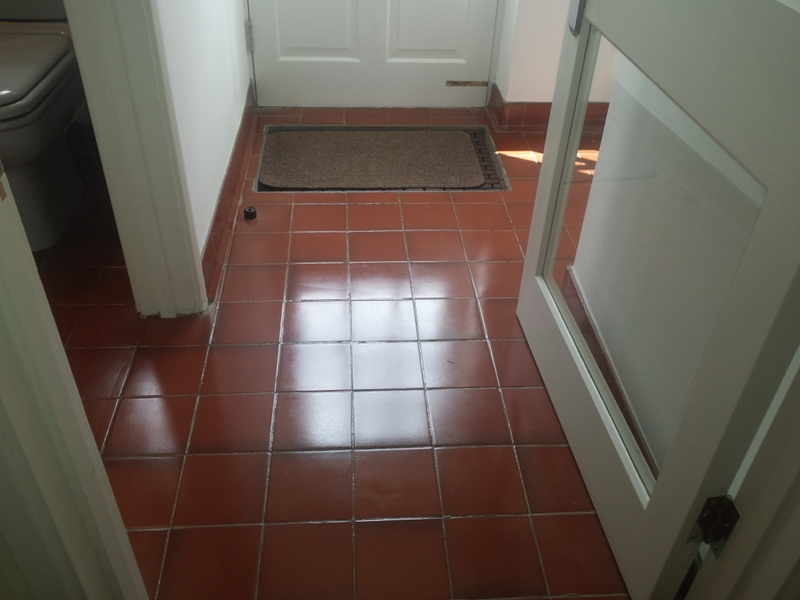 Due to the owner having a large dog, we suggested a matt finish as this would not be as high maintenance as a polished finish as any scratching to the floors from the dogs claws would not be as visible. 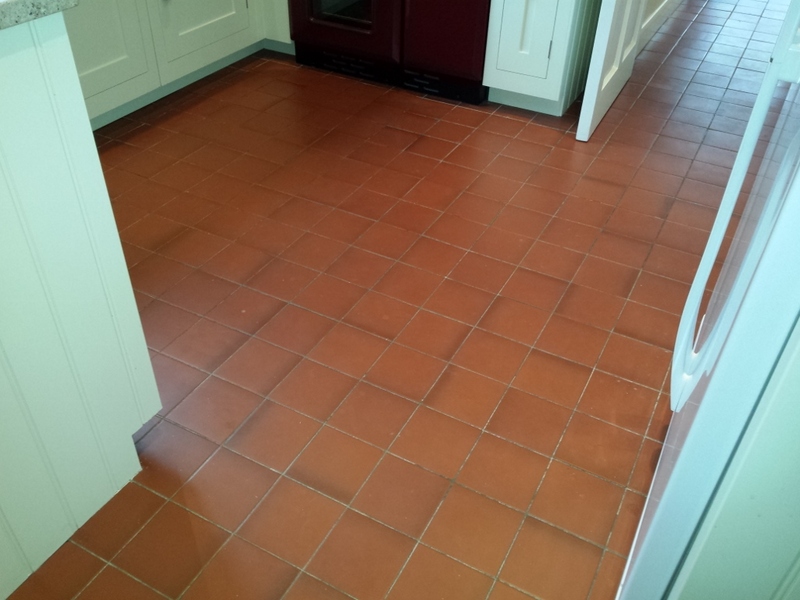 We also applied an impregnator to the floors to help protect the stone, and left the client with a maintenance product and discussed with him how he should look after his newly restored floors. 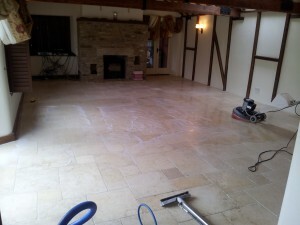 If you are looking for Travertine floor cleaners in Oxford, contact the professionals on 07876255526. 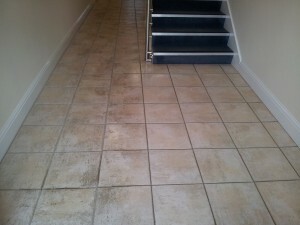 This commercial floor cleaning in Oxford is a communal area in a block of flats. 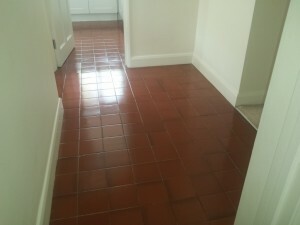 We cleaned the carpeted staircases and landings as well as the tile and grout on the ground floor. 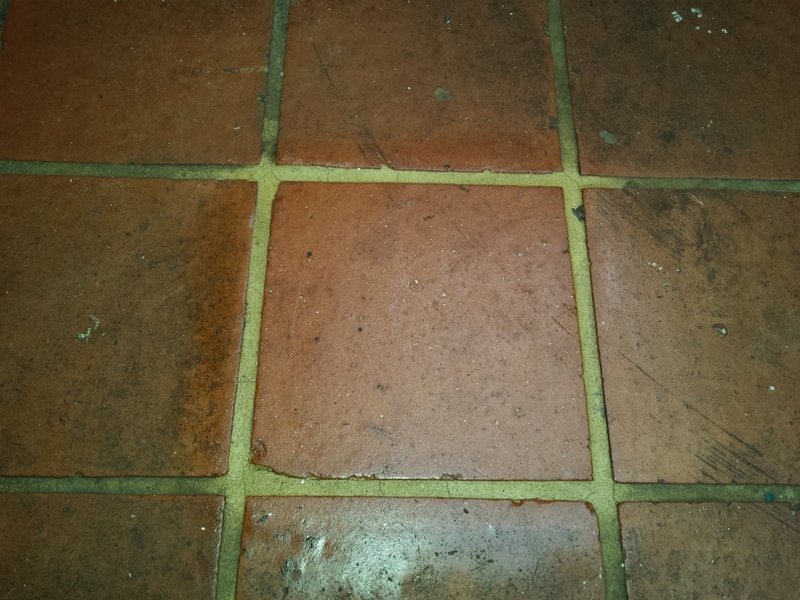 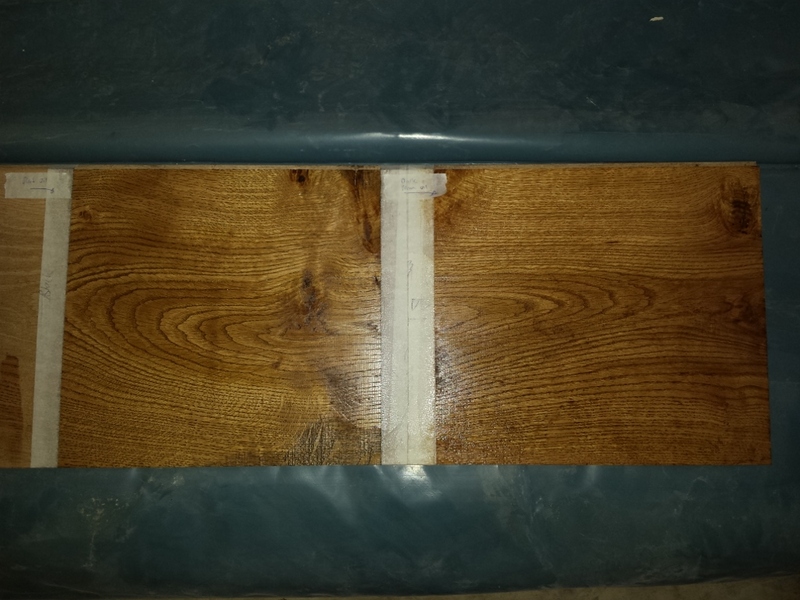 The picture below shows the left hand side untouched and the right hand side cleaned with great results. 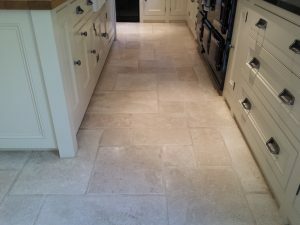 We restored the beautiful natural stone floors at this property consisting of a travertine kitchen and utility, and a limestone hallway. 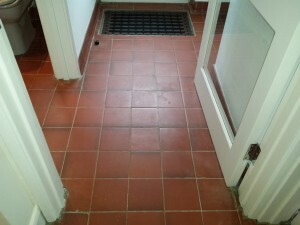 As you can see from the pictures, all floors cleaned up really well including the grout lines, and any marks were removed. 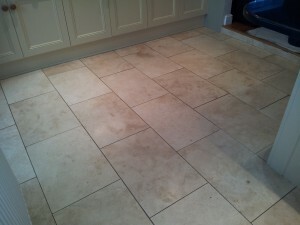 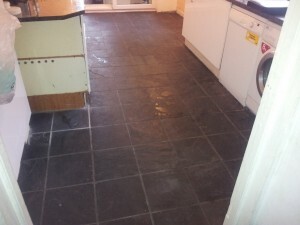 Great results were achieved on this slate cleaning and sealing in Oxford. It was very dull, stained and marked so we stripped and deep cleaned the floor, then neutralised it and dried it, before applying 4x coats of sealer and 2x coats of a gloss sealer on top to give it the shiny finish that the client requested. 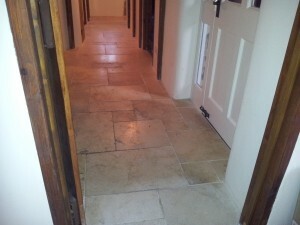 I looks a different floor and has been given a new lease of life which the client is very happy with! 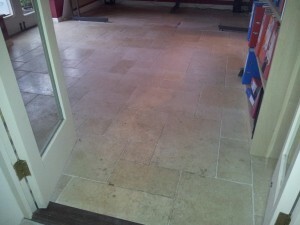 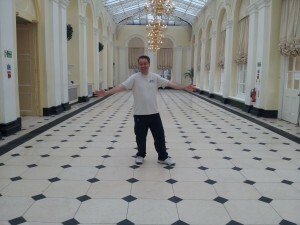 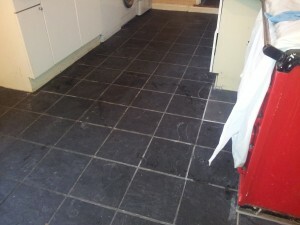 If you would like your slate floor cleaning in Oxfordshire then please contact us and we would be happy to help. 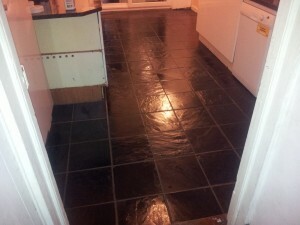 We are a fully trained, professional slate cleaning company!